The Air Force announced recently that a B-2 bomber at Nellis Air Force Base conducted a simulated test of the modernized B61 nuclear gravity bomb that the Pentagon says will have some earth-penetrating capability. However, the B61 Mod 12 will not be capable of exploding through hundreds of feet of rock or concrete that protects Russia's Kasvinsky Mountain nuclear command post, or key underground command centers in the 3,000-mile-long Great Underground Wall complex that houses China's nuclear forces and leaders. North Korea and Iran also have dug deep underground bunkers to hide leaders and protect weapons systems from precision aircraft and missile strikes. North Korea is believed to store its nuclear warheads in secret deep underground lairs that are not vulnerable to current penetrator bombs. Iran too has built large underground complexes for its missile systems. Military studies have shown that adversaries have shifted to the use of underground bunkers to protect against the U.S. military's precision strike capabilities that combine satellite navigation with guided missiles and bombs. To counter American precision strikes, China, Russia, North Korean, and Iran began burying facilities and hardening them with high-stress concrete and digging deep with advanced tunneling equipment that burrows hundreds of feet under ground and through solid rock. In addition to a lack of earth-penetrating nuclear bombs, the military also is concerned by the lack of intelligence needed to identify hidden underground facilities and target them. The Pentagon's recent nuclear posture review outlining the administration's nuclear modernization noted the increasing use of hardened underground facilities by adversaries. The report said China and Russia "are fielding an array of anti-access area denial (A2/AD) capabilities and underground facilities to counter U.S. precision conventional strike capabilities." For North Korea, the report said Pyongyang relies on hardened and deeply buried facilities "to secure the Kim regime and its key military and command and control capabilities." "Consequently, the United States will continue to field a range of conventional and nuclear capabilities able to hold such targets at risk," the nuclear posture review said. The weapons the military plans to use against hardened underground targets are the B83-1 gravity bomb, with a reported yield of around 1.2 megatons, or the equivalent of 1.2 million tons of TNT, and the B61-11 gravity bomb, that has a reported yield of 400 kilotons. "The B83-1 and B61-11 gravity bombs can hold at risk a variety of protected targets," the Pentagon posture report said. "As a result, both will be retained in the stockpile, at least until there is sufficient confidence in the B61-12 gravity bomb that will be available in 2020." The Mod 11 nuclear gravity bomb is said to have earth-penetrating capability. But nuclear experts say it does not have sufficient capability to hold at risk strategic targets that are protected by hardened layers of rock or concrete—often hundreds of feet below the surface. Air Force Maj. Meghan M. Liemburg-Archer, a spokeswoman for the Strategic Command told the Washington Free Beacon the Mod 11 gravity bomb is part of the command's plans for targeting hardened targets. "The B61-11 is only part of a mix of conventional and nuclear capabilities that hold a variety of adversary hardened and underground facilities at risk," she said. "We are routinely assessing capabilities to ensure the ability to effectively deter strategic attack, assure our allies, achieve our objectives should deterrence fail, and hedge against uncertain futures." A National Academy of Sciences study in 2005 concluded fortified underground targets cannot be destroyed with conventional explosives. One or a few nuclear weapons will be needed. "Many of the more important strategic hard and deeply buried targets are beyond the reach of conventional explosive penetrating weapons and can be held at risk of destruction only with nuclear weapons," the report said. The study found that underground facilities are used to conceal leaders, military and industrial personnel, weapons, equipment, and other assets. An estimated 10,000 underground hardened targets include about 20 percent that have a strategic function and half of those are in or near urban areas, complicating targeting. Many underground command-and-control complexes and missile tunnels are hidden 328 feet and 1,300 feet below ground in rock or concrete with the majority less than 820 feet deep. Some are as deep as 1,640 feet to 2,296 feet in granite or limestone. The new B61-12 bomb test took place June 9 at the Tonopah Test Range in Nevada. The flight test of the unarmed bomb showed "continued progress of the B61-12 life extension program to meet national security requirements" said Brig. Gen. Michael Lutton, a senior National Nuclear Security Administration official. The latest B61 is supposed to consolidate and replace all existing B61s and will enter production fiscal 2020. The weapon is said to be able to be used for different kinds of attacks, such as low-yield strikes, surface detonations, high-yield bursts, and earth penetration. But its earth-penetrating capability is in question. "The Mod 12 will have very little capability against hard and deeply buried targets," said Mark Schneider, a former Pentagon nuclear policymaker. "Accuracy does not get you much against [hard, deeply buried targets]. Absent penetration, yield is critical." Schneider said earth-penetrating nuclear arms require high-yield blasts and it is not clear the B61-12 will have enough power. "Unless you have earth and rock penetration—which reduces the yield required by probably a factor of 15 depending on how far it can get underground—the only way to destroy a very hard and deeply buried target is [high] yield," Schneider said. "The Obama administration in congressional testimony said that the yield of the Mod 12 was close to the lowest B-61 maximums yield. Enhanced accuracy alone does not get you much against hardened, deeply buried targets," he noted. A state-run Russian Sputnik News report that stated the Mod 12 would be a penetrator is "clearly disinformation" from Moscow, Schneider said. "There are clearly enormous numbers of [hardened deeply buried targets] that are critically important to deterrence," he said. "If we can't threaten them, our deterrent is eroded." Maintaining deterrence against Russia is becoming more difficult because of Moscow's efforts to expand its large, hardened underground nuclear facilities. Defense officials disclosed to the Free Beacon in August 2016 and December 2017 that the Russian military was expanding and upgrading underground nuclear facilities around the country, including at Kosvinsky Mountain, a major command center located several hundred miles east of Moscow. In response, the Pentagon is considering the use of two modified lower-yield warheads combined with precision guided missiles to target underground bunkers. Schneider, now with the National Institute for Public Policy, said keeping the B83 and B61 is a good step but will be insufficient. "The B61 Mod11 penetrator was developed because the B-83 was not good enough against hardened deeply buried targets," he said. 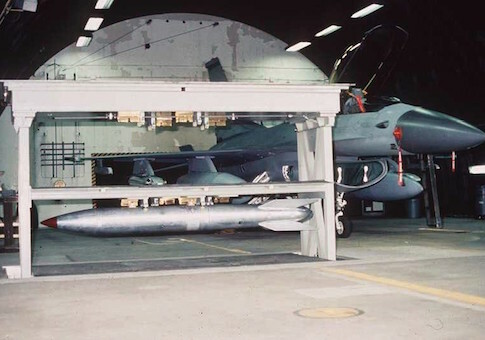 "The B61-Mod 12 has to be much less capable against those targets than the B-83 because they are both lay down bombs with reportedly a massive yield difference." In the late 1990s, the Pentagon was considering development of a new earth-penetrating nuclear bomber and work was done on the Robust Nuclear Earth Penetrator. But that program was ended during the George W. Bush administration. The current nuclear modernization program included building new strategic nuclear delivery systems over the next 28 years that the Congressional Budget Office estimates will cost for $1.2 trillion. Under the program, $772 billion will be spent on new bombers, missiles, and missile submarines; $25 billion will go for tactical nuclear arms and $445 billion will be spent to modernize laboratories and production facilities and new command and control systems and upgraded communications and early warning systems. Another former government nuclear weapons specialist who spoke on background, said the Chinese and Russians have fielded "super hard" targets. The Mod 12 is not an earth penetrator and B61-11 is the only nuclear bomb designed to defeat some underground targets, the former official said, adding that the latter "is unlikely to defeat the modern hard and deeply buried targets fielded by Russia, and more recently by China." Russia's rail mobile systems are deployed in tunnels in south central Russia under 328 feet of granite and were the main reason for unsuccessful efforts to develop a new earth penetrating nuclear bomb in the late 1990s and early 2000s. Under pressure from anti-nuclear activists, the program was killed by House Republicans in 2005. Another potential penetrator weapon is the new low-yield variant of the D5 nuclear missile warhead that will be able to penetrate some Russian and Chinese air defenses and could "hold many—but unlikely all—hard targets at risk," the former official said. "Both China and Russia have drawn a ‘red line' around their command-and-control facilities, and regard an attack on these capabilities as justifying a nuclear response," the former official said. "Hence in a conventional conflict, both China and Russia are doctrinally prepared to use nuclear weapons first." The U.S. military, the former official said, is going in the opposite direction from the Russians and Chinese who are streamlining their structure. Plans for a space force as a sixth military branch and elevating Cyber Command to a combatant command "are creating more stove-pipes that are not readily integrated," the former official said. Deployment of a future American hypersonic strike vehicle with precision strike capability may be able to hold superhard Chinese targets at risk, but current plans call for the missile to be non-nuclear tipped and thus unable to penetrate hardened targets. Hans Kristensen, a nuclear expert with the Federation of American Scientists, said physical limits determine how deep a weapon, nuclear or conventional, can penetrated. The B61 was built to penetrate Russian underground targets and can burrow to around 15 to 20 feet, he said. "The B61-12 is not a designated penetrator but has some limited capability nonetheless," he said. Kristensen believes a weapon does not need to reach the underground facility and can attack it by through "ground-shock coupling." "You only have to get the explosion about 3 meters below to get the effect," he said. "By doing that, a penetrating warhead with a modest yield will have the same effect as a much more powerful weapon detonated on the surface." "The 50 kiloton B61-12 would, if detonated 3 meters below the surface, have the same effect as a surface blast of 750 kiloton to 1,200 kiloton weapon," he said. The B61-11 can reach to 400 feet down and the canceled RNEP, with a 1-megaton yield, would have reached up to 800 feet deep. "In comparison, the 9 MT surface blast of the old B53 could have destroyed down to 750 feet," Kristensen said. "It is always possible to build facilities deeper underground than can be threatened directly with these penetrators," he said. "The real issue is how important it is to get to them." This entry was posted in National Security and tagged China, Iran, North Korea, Nuclear Weapons, Russia. Bookmark the permalink.